Known as the Tree of Life to the Pima Indians, the Mesquite (mess-KEET) is common in the deserts of Arizona. There are three native species in Arizona, the Honey Mesquite, the Velvet Mesquite and the Screwbean Mesquite. Mesquites can grow into large, shady trees and are used in landscaping as well as found growing wild. Mesquites are members of the Fabaceae Family, one of the largest plant families. A familiar member of this family is the pea plant. The unifying characteristic of these plants is the seed pod they create, called a legume. Many legumes are able to convert atmospheric nitrogen into compounds useful to plants, through the nodules they have on their roots. Mesquites are able to do this and this makes them valuable to the other plants in the poor growing conditions of a desert. They also act as nurse trees for slow-growing plants. 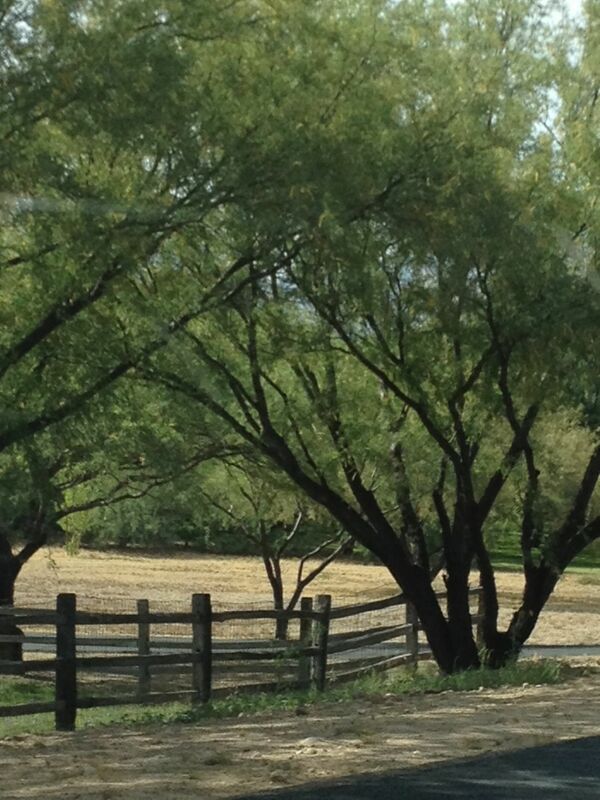 Birds, insects and other animals rely on the Mesquite beans as a food source and for shade and nesting. Often the Mesquites found throughout the desert are no more than a shrub, but under good conditions, they become large trees. 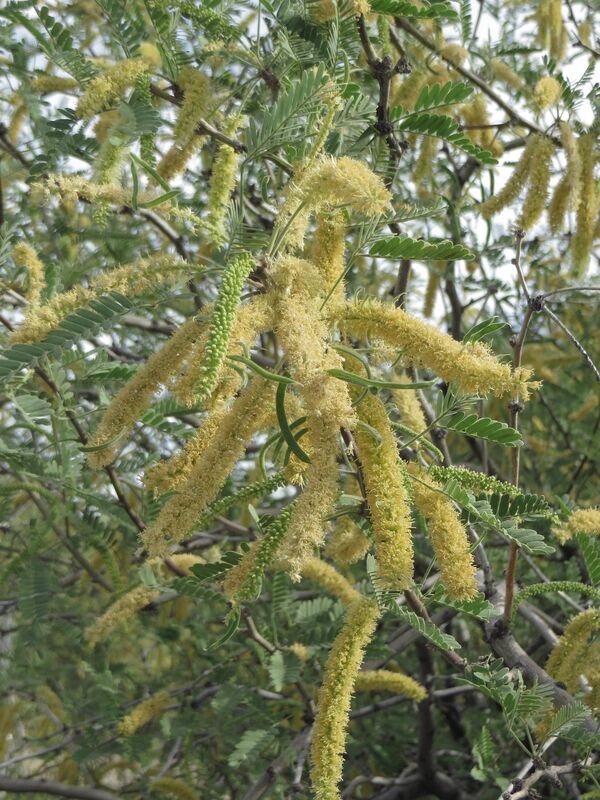 Mesquites bloom in the Spring with creamy yellow dense, narrow clusters. Mesquite in bloom, North Mountain Preserve, Phoenix. Historic records show that every part of the Mesquite had a use to the native peoples, for wood, for flour made of ground pods (pinole), the bark for baskets, medicines, and fabric. Today they are used in much the same ways. Mesquite burns slowly and is nearly smokeless, so it is popular as fuelwood. It makes an aromatic charcoal for barbecuing. Mesquite honey is very popular. The Velvet Mesquite, Prosopis velutina, is very common in the southern part of Arizona. It is remarkable in appearance because of fuzzy, short hairs that cover the entire tree and pods, making it look velvety. The pods when ripe are narrow and brown and up to 8 inches long. This tree can grow a very long taproot, allowing it to access water deep underground. The Velvet Mesquite can get quite large, with a two-foot trunk and 30 feet tall or more. They can be found along streams or washes in shady thickets. Along some desert rivers, like the Verde and the San Pedro, dense mesquite bosques (forest in Spanish) can be found. The Honey Mesquite, Prosopis glandulosa, has large spikes or thorns of up to three and a half inches and a sweet taste that make its beans delicious. The bean pods are mostly straight and up to 8 inches long. Its flower is a favorite of bees. It is a smaller tree than the Velvet Mesquite. The Screwbean Mesquite, Prosopis pubesens, like the Velvet Mesquite, has rough bark that separates into long, narrow strips. The bean pod on this tree gives it the name, Screwbean, because instead of a long straight pod, the pod is tightly coiled and spirals to 2 inches. 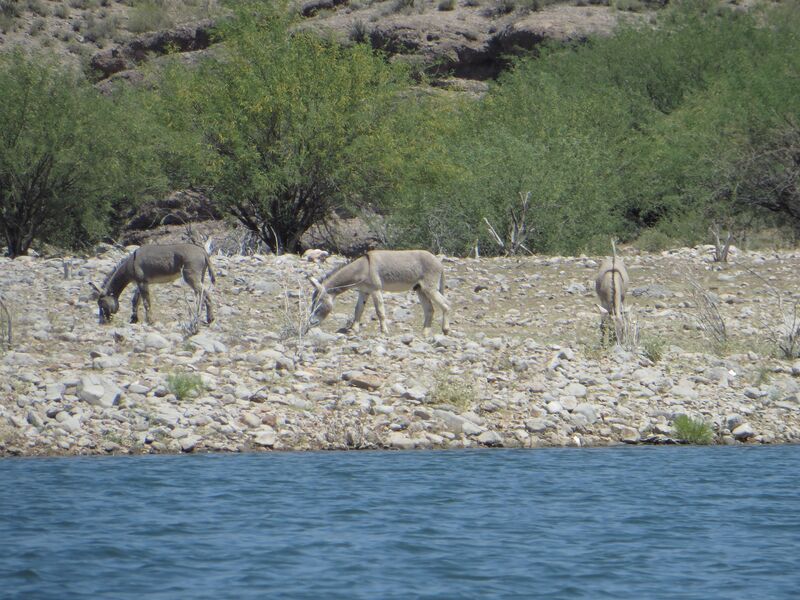 Mesquites growing on the shore at Lake Pleasant, with wild burros. This entry was posted in Arizona, Desert, Desert Plants, Lakes, Prehistoric Arizona and tagged Arizona, Botany, desert, History, Honey Mesquite, Mesquite, Mesquite Bosque, Mojave Desert, Screwbean Mesquite, Sonoran desert, Velvet Mesquite.